In recent years, research information systems (RIS) have become an integral part of the university’s IT landscape. At the same time, many universities and research institutions are still working on the implementation of such information systems. Research information systems support institutions in the measurement, documentation, evaluation and communication of research activities. Implementing such integrative systems requires that institutions assure the quality of the information on research activities entered into them. Since many information and data sources are interwoven, these different data sources can have a negative impact on data quality in different research information systems. Because the topic is currently of interest to many institutions, the aim of the present paper is firstly to consider how data quality can be investigated in the context of RIS, and then to explain how various dimensions of data quality described in the literature can be measured in research information systems. Finally, a framework as a process flow according to UML activity diagram notation is developed for monitoring and improvement of the quality of these data; this framework can be implemented by technical personnel in universities and research institutions. The topic of ‘‘research databases and research information systems’’ is by no means new. In recent years, the introduction of research information systems at universities and research institutions has strongly increased in Germany and throughout Europe (DINI AG Research Information Systems 2015). 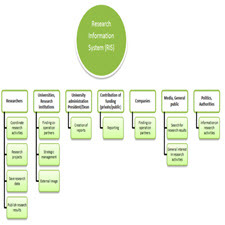 Research information systems can provide universities and research institutions with a current overview of their research activities, collect information on their scientific activities, projects and publications and manage and integrate into their website. For researchers, they offer opportunities to collect, categorize and make use of research information, be that for publication lists, for the development of new projects, to reduce the effort required to produce reports, or in the external presentation of their research and scientific expertise. در سال های اخیر، سیستم های اطلاعات تحقیقاتی (RIS) تبدیل به بخشی جدایی ناپذیر از فناوری اطلاعات دانشگاه شده است. در عین حال، بسیاری از دانشگاه ها و مؤسسات تحقیقاتی همچنان در پیاده سازی چنین سیستم های اطلاعاتی کار می کنند. سیستم های اطلاعات تحقیقاتی از موسسات در اندازه گیری، مستند سازی، ارزیابی و ارتباط فعالیت های تحقیقاتی حمایت می کنند. پیاده سازی چنین سیستم های یکپارچه نیازمند آن است که نهادهای اطمینان از کیفیت اطلاعات مربوط به فعالیت های تحقیقاتی وارد شده به آنها باشد. از آنجایی که بسیاری از اطلاعات و منابع داده ها درهم تنیده می شوند، این منابع مختلف اطلاعات می توانند بر کیفیت داده ها در سیستم های مختلف اطلاعات پژوهشی منفی داشته باشند. از آنجا که موضوع در حال حاضر برای بسیاری از موسسات مورد علاقه است، هدف مقاله حاضر اولا بررسی چگونگی بررسی کیفیت داده ها در زمینه RIS است و سپس توضیح می دهد که چگونه ابعاد مختلف کیفیت داده ها در ادبیات شرح داده می شود در سیستم های اطلاعات پژوهشی. در نهایت، یک چارچوب به عنوان جریان فرآیند با توجه به نشانه نمودار فعالیت UML برای نظارت و بهبود کیفیت این داده ها توسعه داده شده است؛ این چارچوب می تواند توسط کارکنان فنی در دانشگاه ها و موسسات تحقیقاتی اجرا شود. موضوع «پایگاه داده های پژوهشی و سیستم های اطلاعات پژوهشی» به هیچ وجه جدید نیست. در سال های اخیر، معرفی سیستم های اطلاعات پژوهشی در دانشگاه ها و موسسات تحقیقاتی به شدت در آلمان و سراسر اروپا افزایش یافته است (DINI AG Information Systems 2015). سیستم های اطلاعات تحقیقاتی می توانند دانشگاه ها و مؤسسات تحقیقاتی را از طریق مرور کلی فعالیت های تحقیقاتی خود، اطلاعات مربوط به فعالیت های علمی، پروژه ها و نشریات خود را جمع آوری و مدیریت و ادغام در وب سایت خود را فراهم کنند. برای محققان، آنها فرصت هایی را برای جمع آوری، طبقه بندی و استفاده از اطلاعات تحقیقاتی مانند لیست های نشر برای توسعه پروژه های جدید، کاهش تلاش برای تولید گزارش ها یا ارائه بی نظیر از تحقیقات و تخصص علمی خود ارائه می دهند. .